We decided to hop in the car with Dada on Wednesday as he went up to Michigan for work. We stayed in Holland, MI after seeing some great pins on Pinterest. We were not disappointed! 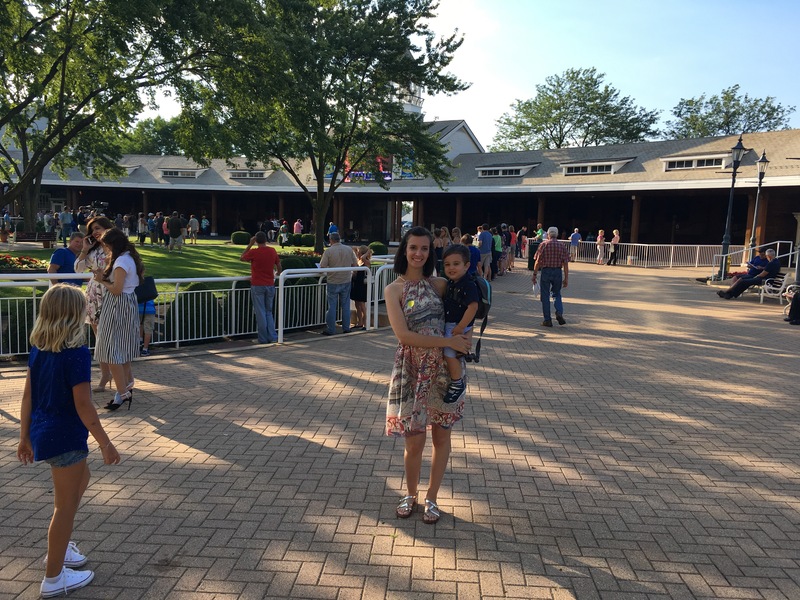 We ended our week with a horse race at Arlington Park with daddy’s work colleagues. Wednesday we got to Holland, MI in the evening. 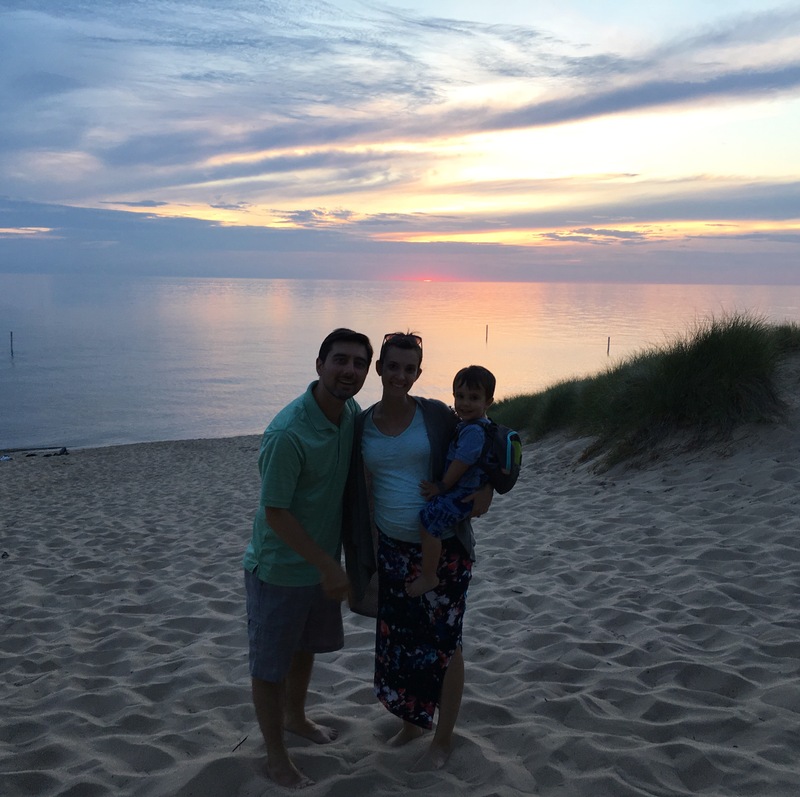 I heard the beaches and sunsets over Lake Michigan here could not be missed, and it is so very true! I packed a picnic dinner for us so we could head straight there after running into the hotel to check in and get room keys. The beaches here are nothing like the Chicago side. The sand is white powder, the water fresh and clear and the sunset, wow! The fire red and hot pink sun dipping down into the water is breathtaking. I only got a pic of us toward the end because I wasn’t going to disturb anyone or myself with electronics in our faces. Please, do yourself a favor (at least the first time) and just watch without distraction. When people were leaving someone kindly offered to take one of all three of us. Our plan was to just picnic and enjoy the sunset, but Bash ended up playing in the water and sand. Should have just a swim diaper and trunks on him anyway. If you have a waterbaby, I’d highly recommend to just go ahead and plan for them to splash around. The beach closed shortly after sunset at 10, so we went back to the hotel and settled in for the night. 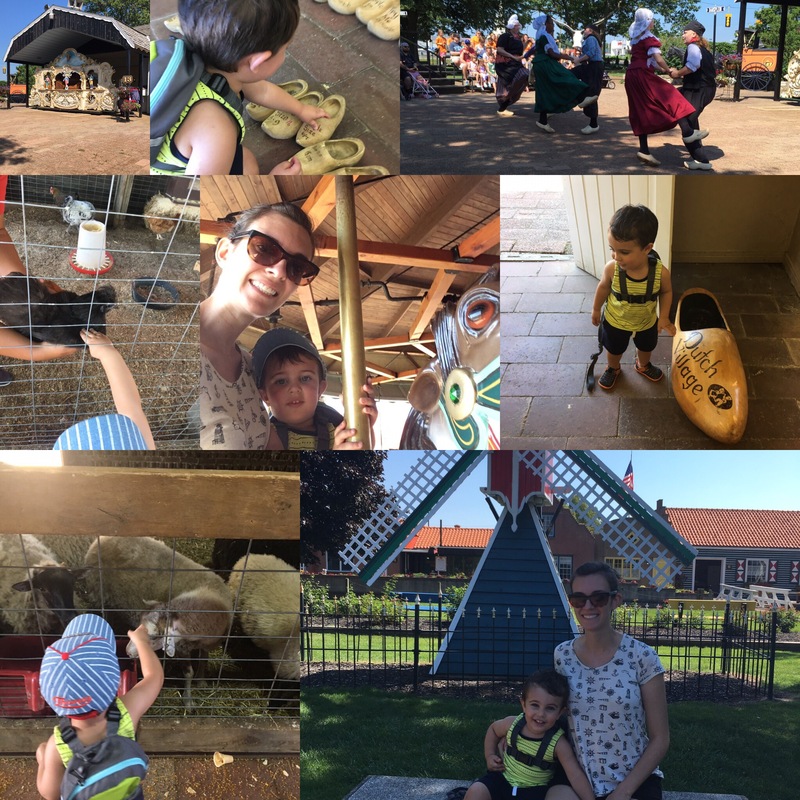 Thursday I took Sebastian to Nelis’ Dutch Village while David went into the local office. This little amusement park/live action museum was super cute and Bash had a great time. The location right next to the outlet mall is a little off putting, but the place really is great for toddlers-bigger children. Their petting zoo/Dutch farmstead is really fantastic. All of the animals were super happy (clearly used to children constantly touching and feeding them) and there a lot of helpers there help the children engage with the animals properly or to pick up animals for the little ones like Bash to get a chance to participate in a less overwhelming way. Bash loved feeding the animals and petting from the outside. You can go inside the stalls, but I think this is something more suited for the rule understanding and stronger more stable 4 yrs+ crowd. They have some little rides, but the carousel was the only one I felt was appropriate for little toddlers. There is also the spinning swings, these kind of train pedal cars and a small windmill themed Ferris wheel. 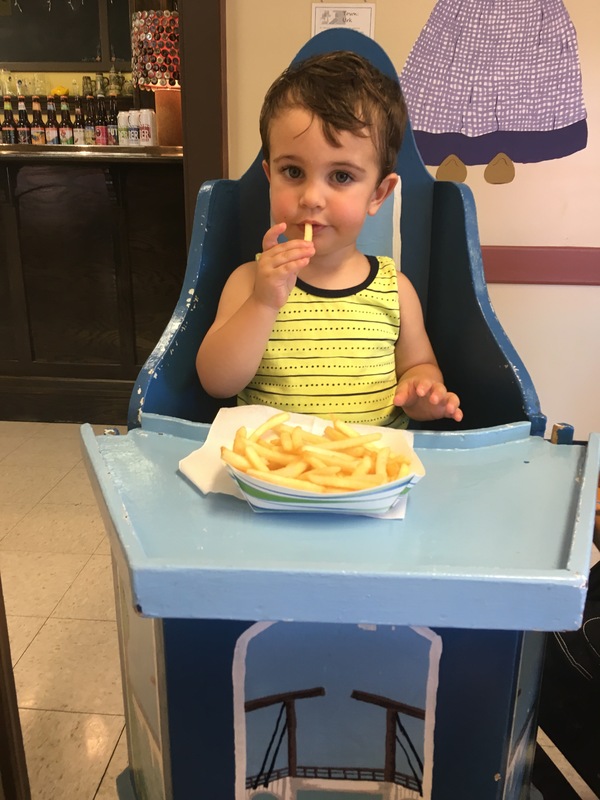 How cool is this high chair, though?! We went back to the hotel for a nap until Daddy was done working. We went to downtown Holland for the evening and were surprised to find a street performer festival. There were street performers everywhere of all different types. This was both cool and annoying. It made the sidewalks too crowded to pass through, but Bash enjoyed the dancers, musicians and acrobats. There are a ton of cute stores in the downtown, something for everyone. There were also a lot of breweries. We planned on going to the New Holland Brewery for dinner, but it was soooo packed and this preggo wasn’t waiting to eat. Hubby has to forgo the beer tasting. 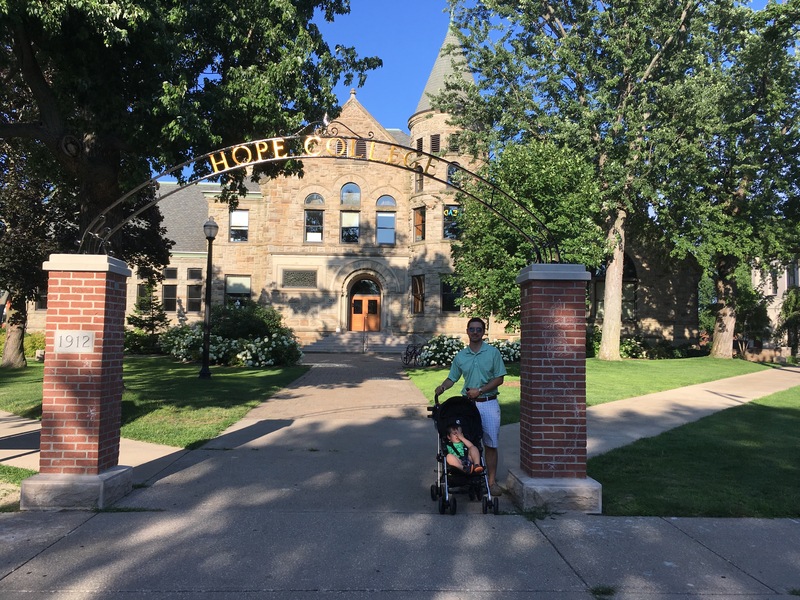 We walked the Hope College campus and then went back to the hotel to go to bed. 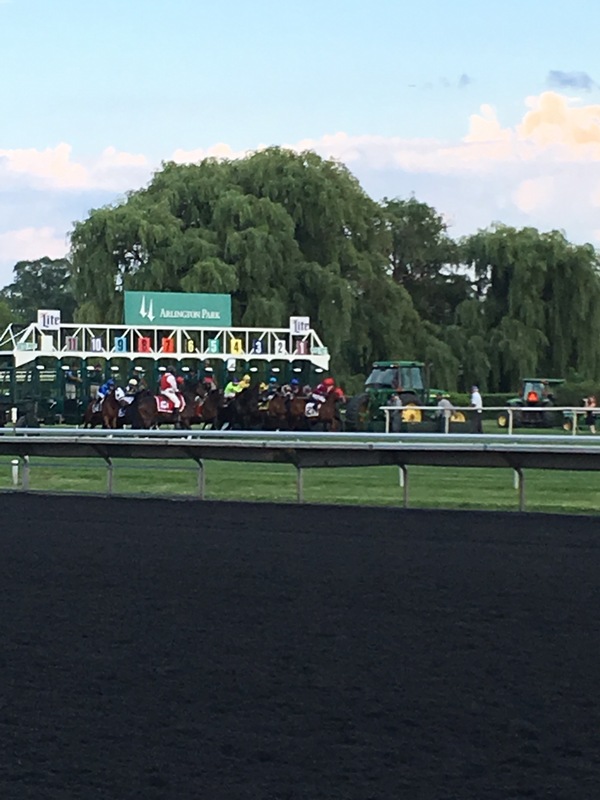 Friday, we checked out and headed over to Chicago for the horse race at Arlington Park. Bash loved the race. 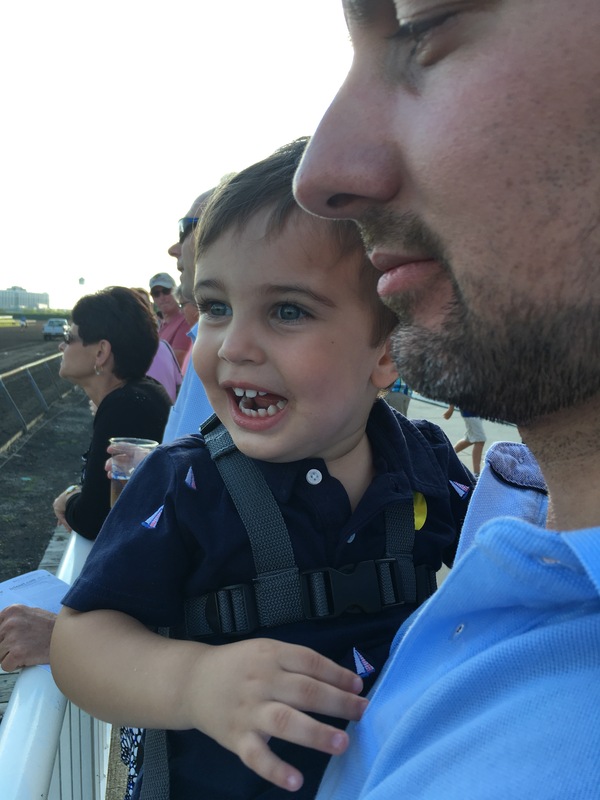 He loved going to the paddock level and seeing all of the horse and jockees. He loved watching them race and yelling go! 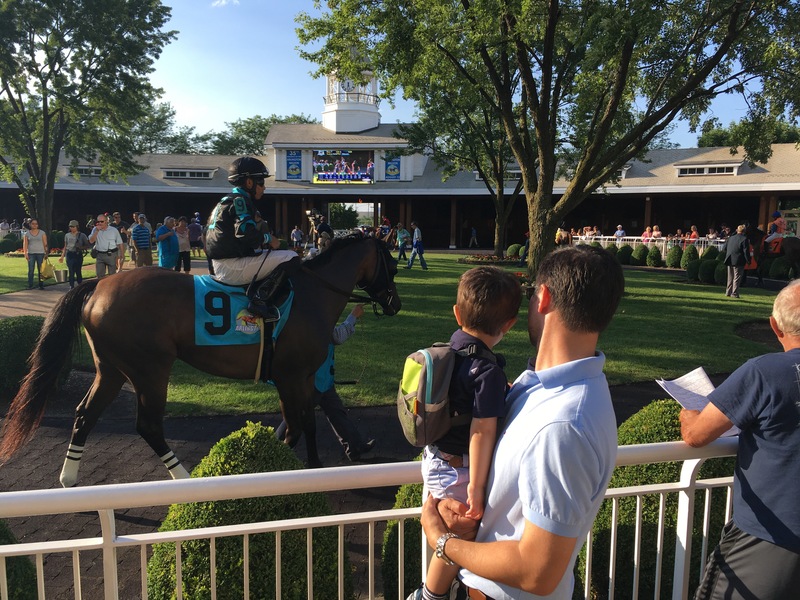 He picked a favorite horse, and we cheered it on. It was a great evening. A horse race might not seem like a great toddler activity, but it had so much going on there was plenty of distraction to keep any little occupied. We ended the night with Bash’s pick not doing very well, but lots of great memories. We went back to the hotel to sleep. and then headed home this morning. 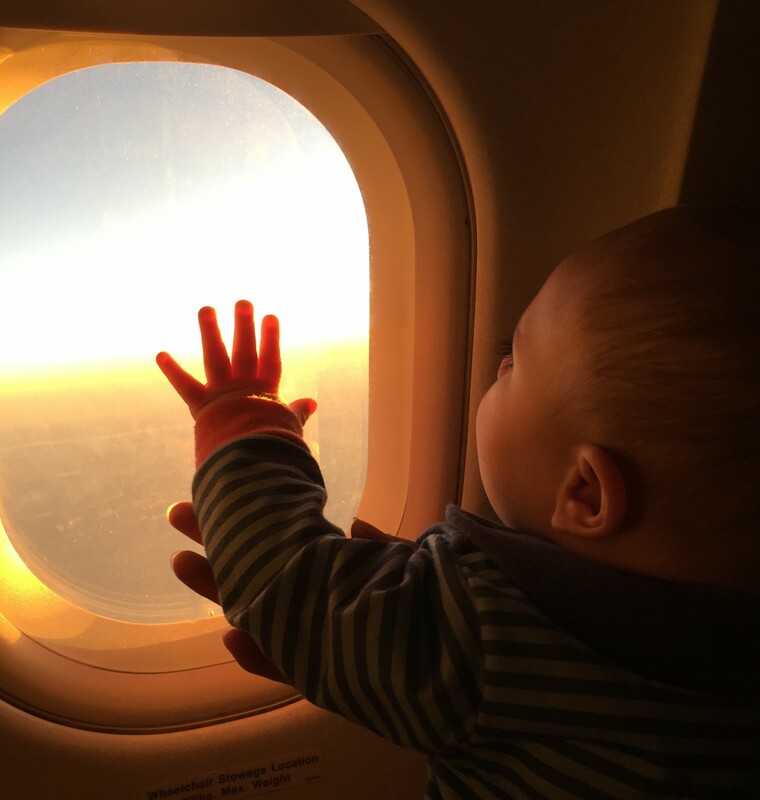 It was a lot of driving for some in 4 days, but with a lot to do inbetween it wasn’t so bad. We had lots of snacks and car toys (Tsum tsums mostly) to keep Bash happy, and he never cried once:) If you are in the Midwest it is definitely worth the drive up to Holland, MI. It was so nice, we will probably rent a lake house for a week up there in the near future. Previous Alert! 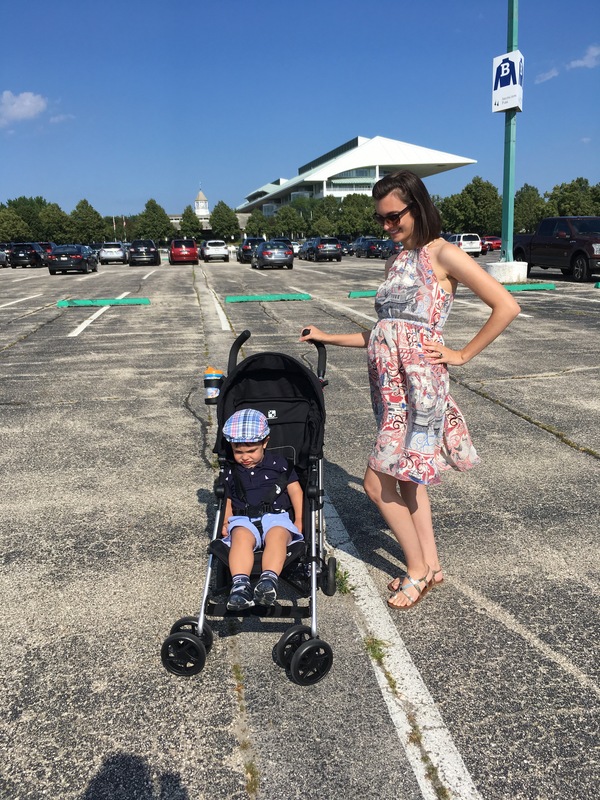 !Great deal on a great travel stroller option! Next Austlen Entourage Stroller, wow! Down here, we don’t get in to lakes because of alligators. Some people do, and I think they are crazy. Is Lake Michigan gross? We got in and didn’t feel like it was bad at all. Now I’m worried. Since y’all are from there, I’m sure you know more. On the Chicago side the sand is dirty and the water smells (in our opinion) but lots of people enjoy it. The Indiana dunes area is nice, my brother likes going there with friends. The Michigan side was more like the ocean and we let Bash play in it. I’m not a big lake person, but I’d probably get in on the Michigan side. We love Holland! So glad y’all had a good time!!! Also, I need to know where you got that dress that you wore to the horse races! It’s gorgeous! We had always heard the Michigan side of Lake Michigan was the nicest, but we loved right on the Chicago side and would never touch that water sooo we had doubt of what “nicer” meant😂 But it really was like a totally different lake and beach!